Originally bred from 50% Golden Retriever, with the other 50% being both, American and English Cocker Spaniel. 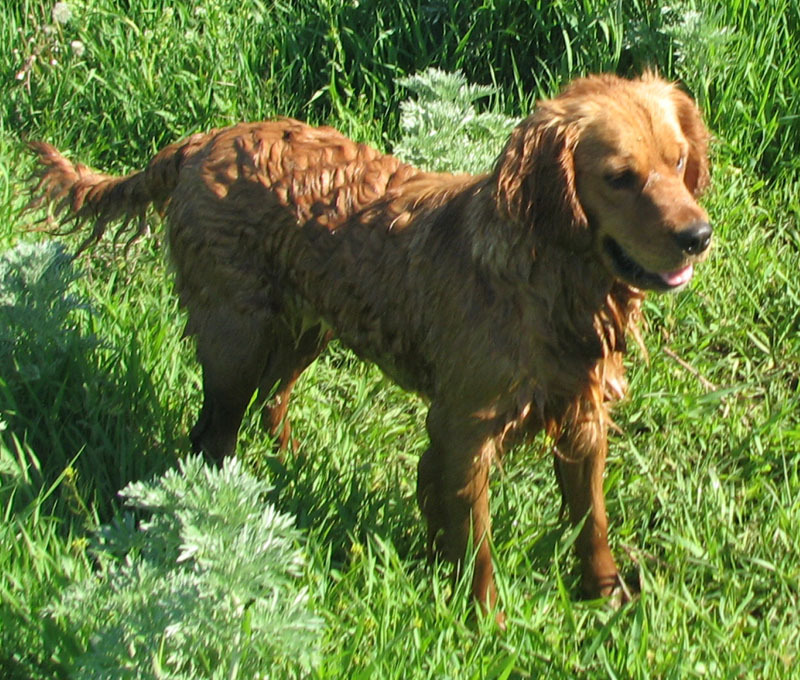 A Dakota Sport Retriever has a unique look and temperament all its' own. 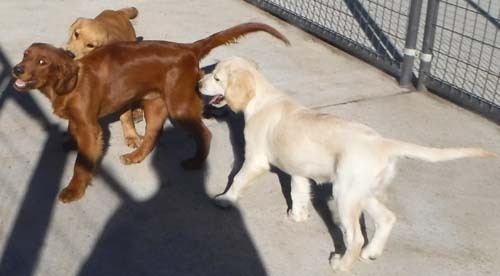 They are bred using 50% Golden Retriever, with the other 50% being American and English Cocker Spaniel in them. Ideally 25% of each breed. However, they may have as much as 37.5% of either English or American Cocker Spaniel in them, with as little as 12.5% of the other. Dogs that are 50% Golden Retriever, and 50% either American Cocker Spaniel, or 50% English Cocker Spaniel, may be registered as breeding stock only. The Dakota Sport Retriever stands from 14 to 19 inches tall, with 15 to 17 inches being average. Males are typically a bit larger then females. They weigh from 20 to 60 pounds, with 30 to 45 pounds being average. Dakota Sport Retrievers come in all colors and patterns. Many being the typical Golden Retriever colors of cream, gold, and red, but black, chocolate, tan marked, sable, parti patterns, roans, and merles are also present. There is also a very unique, special color called Black Gold, that is black & gold hairs mixed together. Eye color may be the typical brown, but also may be a lighter brown, amber, green, blue, or what is known as a merle eye, that is partial colored. They have unique "slipper" feet, with hair between their toes. They have from a straight, smooth coat, to a wavy coat. They are considered a long haired breed, but shed less then purebred Golden Retrievers. Dakota Sport Retrievers love water, love to fetch, and are very fun dogs outdoors, while being calm indoors. They are very gentle, loving family dogs. They can be trained to hunt upland birds and/or water fowl. They love toys, and often carry toys around. If a toy is not available, they may carry anything that they can find! Dogs with over or under bites, umbilical hernias, hip or eye problems, or other health issues should not be bred. The Dakota Sport Retriever has an excellent, people oriented, outgoing temperament, and no shy, aggressive, or hyper dogs should be bred. 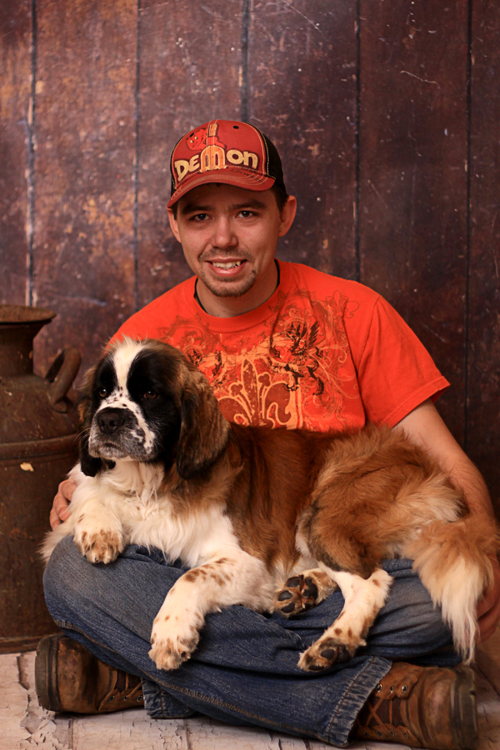 Our son, Gage, with his adult Micro sized Miniature Saint Bernard breeding male, Beethoven! Some of our up and coming future breeding dogs! 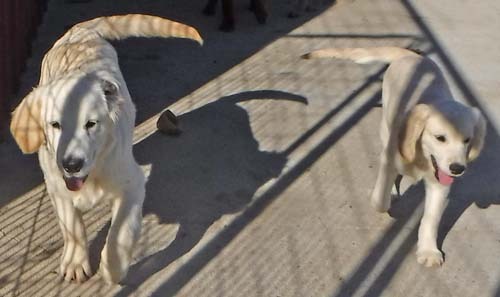 Future pair for cream colored puppies!